Bert Dohmen Predicts… An Economic Shocker! Friday’s (6/3/2016) jobs report was terrible. Only 36,000 jobs were created versus expectations of around 200,000. The only job growth was in government (wonderful) and health care, which is more government, Obamacare. The amazing thing was that the unemployment rate plunged to 4.7%. That’s the number Washington will brag about. But they won’t mention that it is because the labor force is shrinking as more people give up looking for jobs. About 450,000 left the labor force last week. The fallacy can be seen by this: theoretically, if all people were to leave the labor force, the unemployment rate would be zero. Washington would probably cheer although no one would be working. We don’t like to say “we told you so,” but we did, since last year when we predicted a recession would be recognized in 2016, while every Wall Street economist was forecasting a stronger economy. Not only were HedgeFolio members protected, but they made some big profits this year, while even the very expensive and high profile hedgefunds on Wall Street reported huge losses…some over 20%. A few other analysts have correctly predicted an economic slump, but how do you convert that into investment profits? That’s exactly why we created our acclaimed HedgeFolios service. Here is the performance for the first 4.5 months of the year. 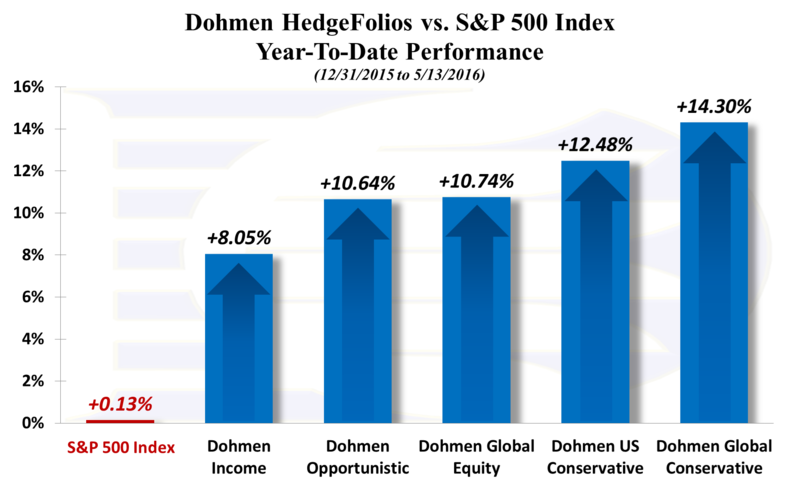 The jobs “surprise” on Friday caused a big jump in the performance of HedgeFolios because we were prepared. Note the comparison, the S&P 500 index, (the red column) had a big drop. HedgeFolios is designed to accrue profits during bull markets, but also to protect you and let you profit during bear markets. Look at the rise early this year while the S&P 500 plunged. HedgeFolios is NOT a managed account program, or a hedge fund. It’s a membership program which gives you five model portfolios you can easily replicate for yourself, just with a click of the mouse. There is nothing like it, anywhere, at any price. The strategy for our HedgeFolios is pro-active. We use advanced technical analysis to identify major turning points in the different sectors, whether industry sector, geographical, or type of investment vehicle. And during times like these, we utilize investments which protect your assets, and may even rise as most stocks decline. Members of HedgeFolios sleep well at night. They are free of worry about their investments. When the markets plunge, they know that the portfolios they replicated will protect them. You have “peace of mind” knowing we are watching the markets for you and monitoring the HedgeFolios. This delivers the “worry-free” investing you always wished for. Simplicity, convenience, transparency, and worry-free investing – all with our professional guidance at your side. We hope to welcome you as a valued Platinum Member (at the 25% off discounted rate). But remember, this special rate will be only be available for a limited time! Preserve your wealth with our guidance today! *Model performance: 12/31/2015 through 5/13/2016. Past performance is no guarantee of future results.